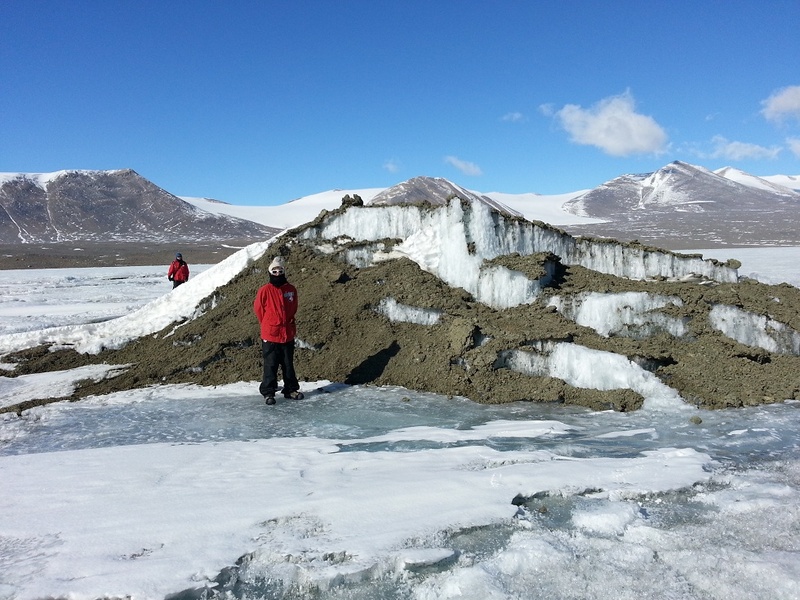 Last week I finally got back to the Dry Valley frozen lakes, bringing cubitainers and Coca Cola. 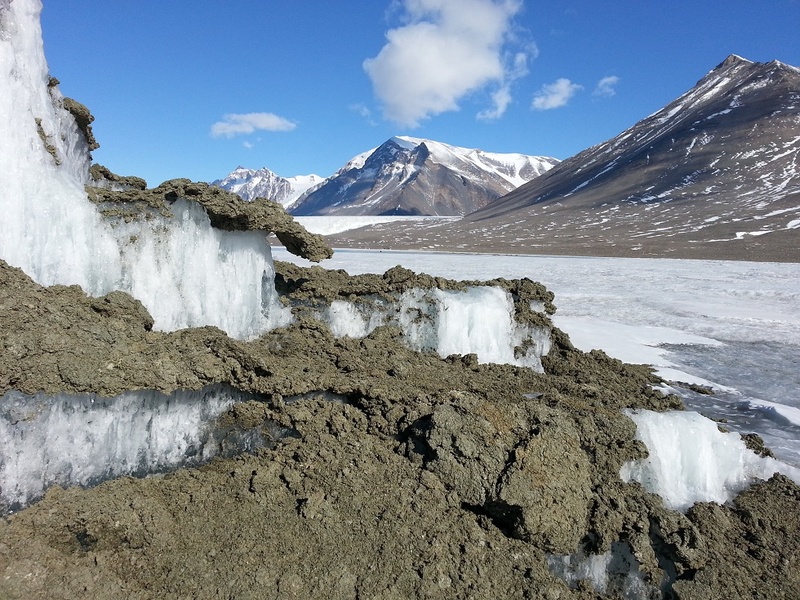 The helicopter stopped briefly at Lake Bonney to join the lab members moving out—to a new camp, at Lake Fryxell. Lakes Fryxell and Hoare (separated by Canada glacier) are on the rough side, as you can see. The ice layers open and rear out of the lake; looking down in, you feel as if looking into the maw of the Dune sandworm. The ice layers open up, scoured by wind and pressed by surrounding ice. They do not open into the liquid water, several meters below. Only at the lake’s edge is the ice melting through. During summer, a watery “moat” surrounds the lake ice, the vast majority of which never thaws. The ice surface however does “ablate” with the wind. Meanwhile, streams form on the mountains, carrying glacier water downhill into the moat. This water is raising the level of several lakes. 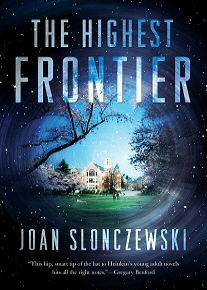 In winter, more water freezes at the base of the ice layer, as the top of the ice ablates; thus, there is a continual upward “treadmill” of ice. The white fluff is ice frozen into crystal towers–very rough. You can barely climb across it. But the helo glides down across the smooth blue ice near shore–where the “moat” will soon melt. The famous “patterned ground” shows up best at 1:30-1:50. The surrounding land looks very different than at Bonney—more gentle slopes before the mountains, full of pebbles rather than sand. 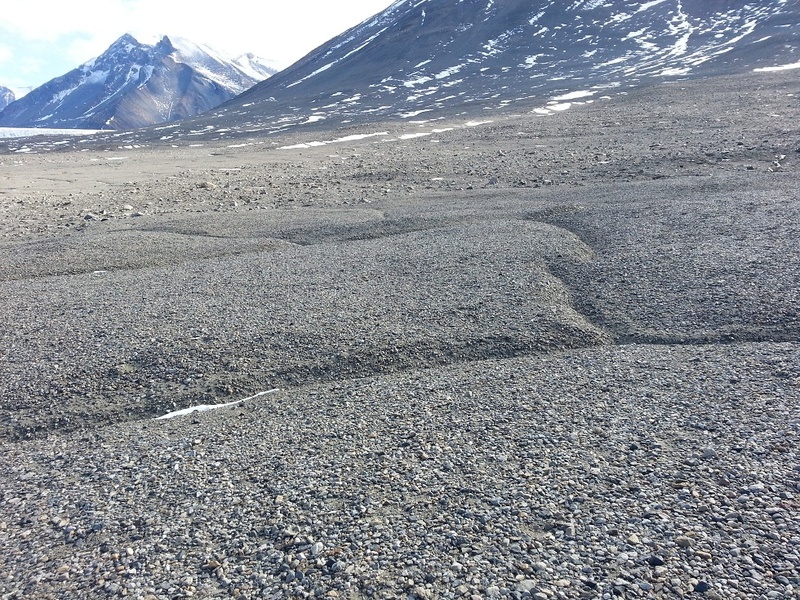 The pebbled slopes form intriguing patterns. The patterned ground (also called “periglacial landform”) consist of long straight grooves that tend to meet at hexagonal angles. The patterned shapes can be large, perhaps a hundred meters, with deep grooves; or they can be small, local, with thumb-wide grooves. The grooves tend to collect rocks and snow; but that is not what forms them. 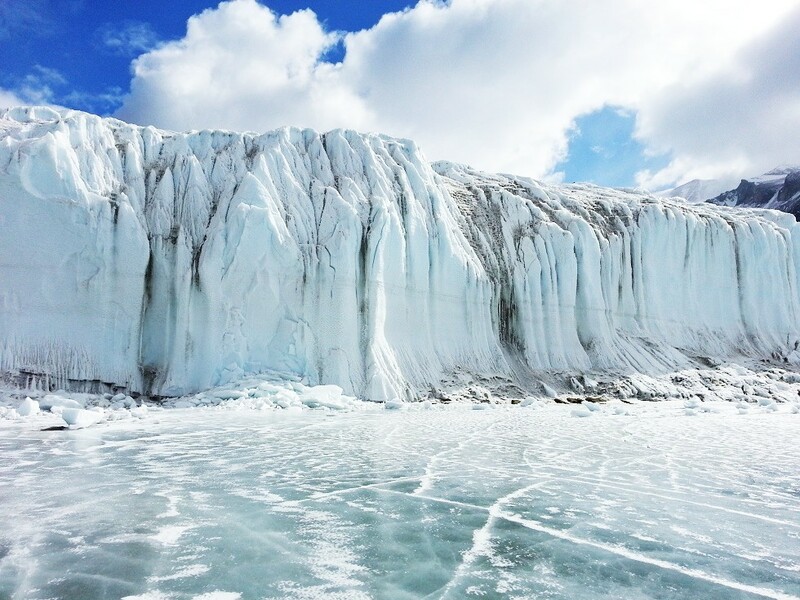 The grooves are caused by repeated freezing and thawing of sediment watered by glaciers. The water-logged sand freezes, then contracts, forming cracks that fill with water. Each cycle of freeze-thaw digs the cracks deeper and wider. That’s why I call this an “upside down lake”—the sediment is on top. Scientists seek clues about tiny life forms that may lie dormant there. 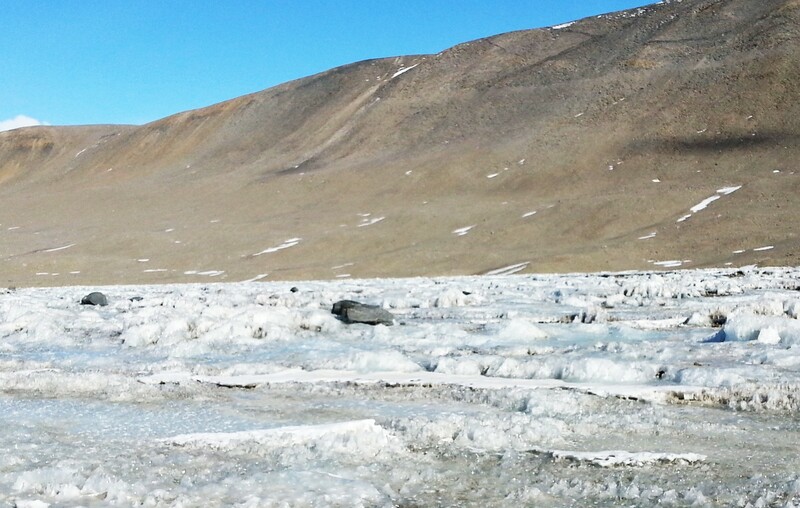 The nearby Lake Hoare has a similar rough ice appearance, much of it too rough for an ATV. We hiked across some of it—warily. The ice forms spindly columns, like a giant field of crystal glass. As you walk over it, the crystal goes crunch with every step. I feel guilty about crushing so much crystal—structures that might have taken years or decades to form. I feel the same about tramping through the patterned ground. Our footprints will last a long time. It is impossible to study this place without marring it a little bit. Of course, the place has its own events of change. Note on Lake Hoare the many rocks perched upon the ice, some of them the size of a car, like the one at Bonney. Where did these many rocks come from? 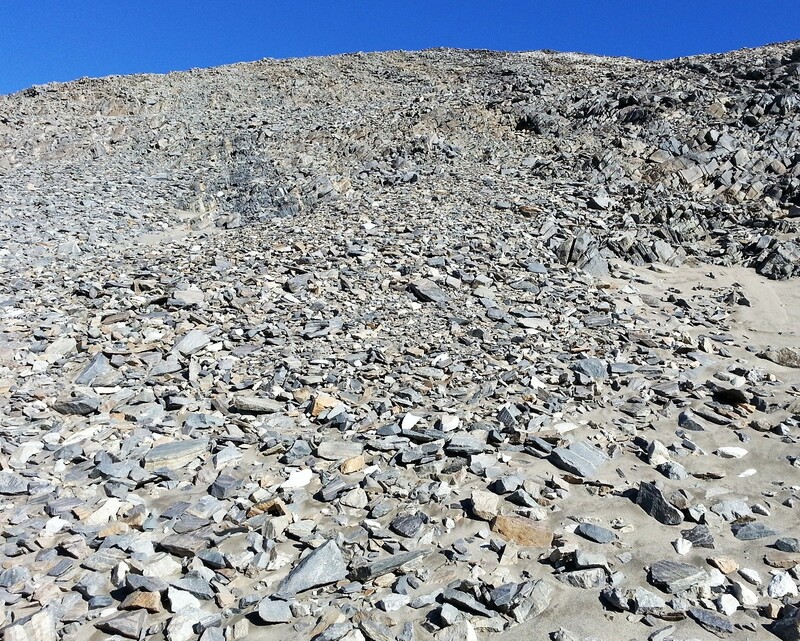 The mountainsides at Lake Hoare are close, steep, and full of rocks. Camp assistant manager Renee reports that recently she heard a loud noise, and looked up to see several large rocks bounding down the slope. 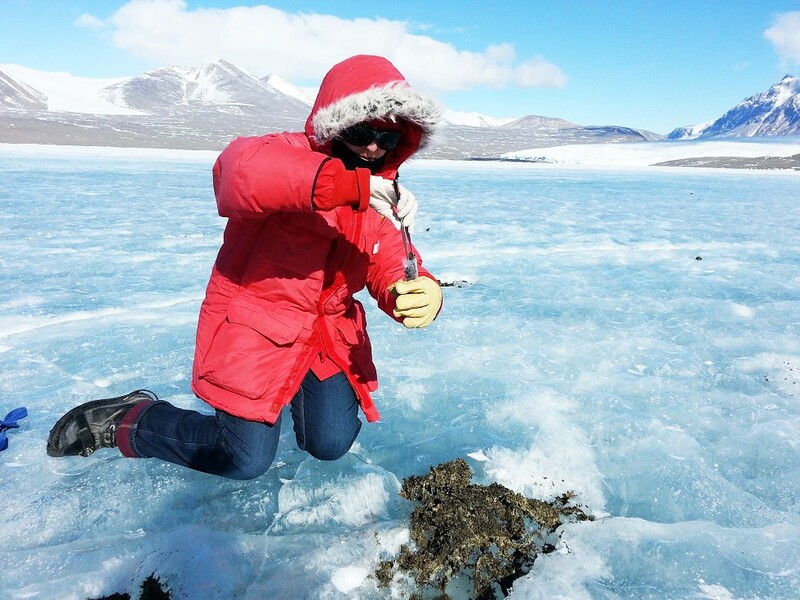 The rocks landed on the ice, forming impact craters. Over time, the wind will scour away the ice surrounding each rock, leaving the rock upon an icy pedestal. 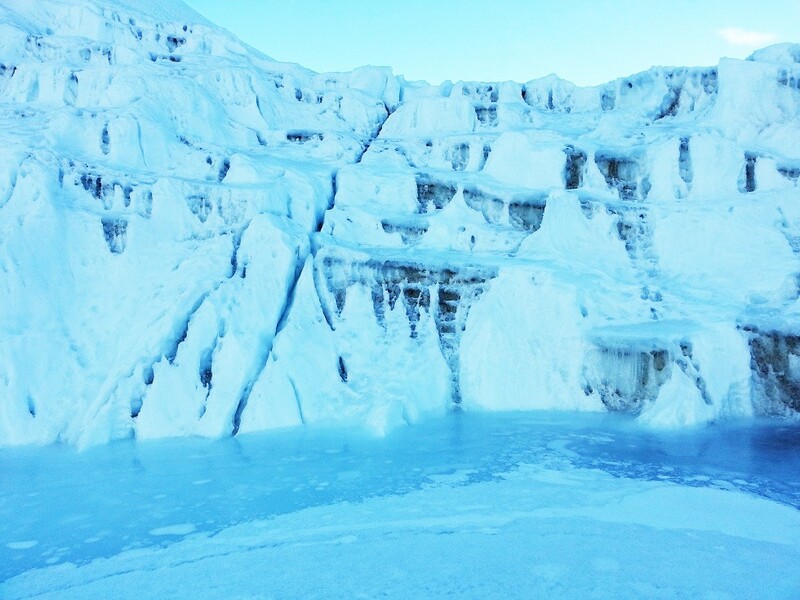 Both Fryxell and Hoare are dammed by Canada glacier. 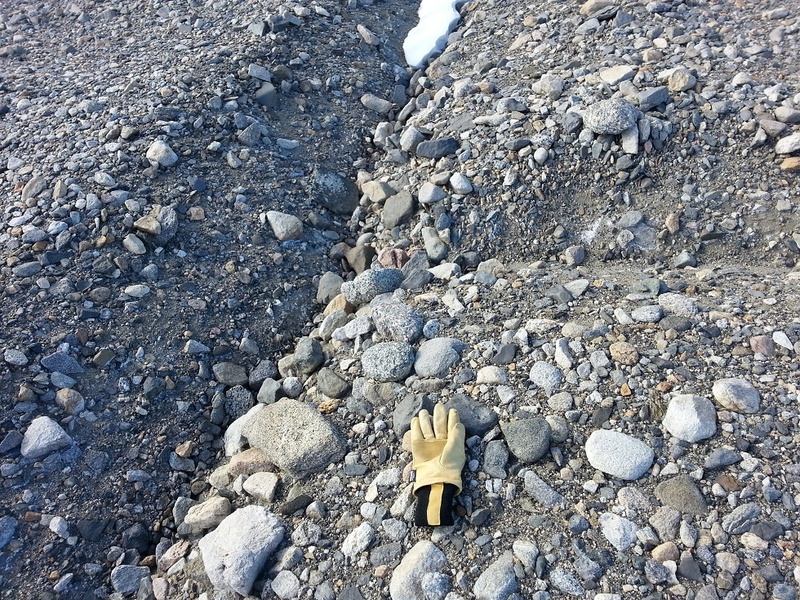 To hike from Fryxell to Hoare, we had to go around the glacier. Frequently we passed a pile of pristine blocks of ice called “glacial berries.” These glacial berries form when the glacier “calves” — that is, a large chunk of glacier falls off and crashed below. The crashing ice block fragments into clean ice. These clean ice chunks are what we collect to boil for drinking water. On this hike we did not witness a piece of glacier fall, but we did hear a sound like a shotgun, the result of a crack forming in the glacier. 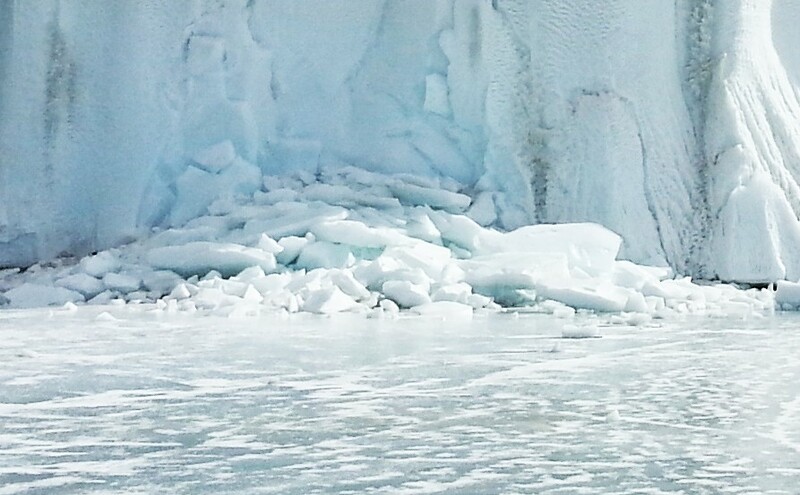 The more wind-exposed side of the glacier forms beautiful shapes, finished like porcelain. Here is a porcelain amphitheater. What science did we do at these lakes? We collected more water samples of algae, using the winch and the Niskin bottle. We also investigated intriguing forms of life called “uplift mats.” You can see them here—little puffs of desiccated cyanobacteria that originally grew in mats at the bottom of the lake. The mats support other life forms such as tardigrades (water bears) and nematode worms—the largests animals known in these frozen lakes. 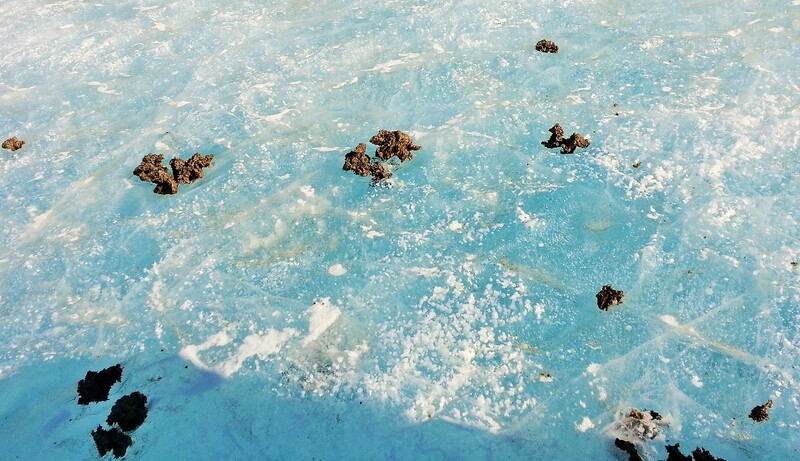 So what are these desiccated mats doing atop the ice? How did they get here? Did they blow in from somewhere to land on the ice? 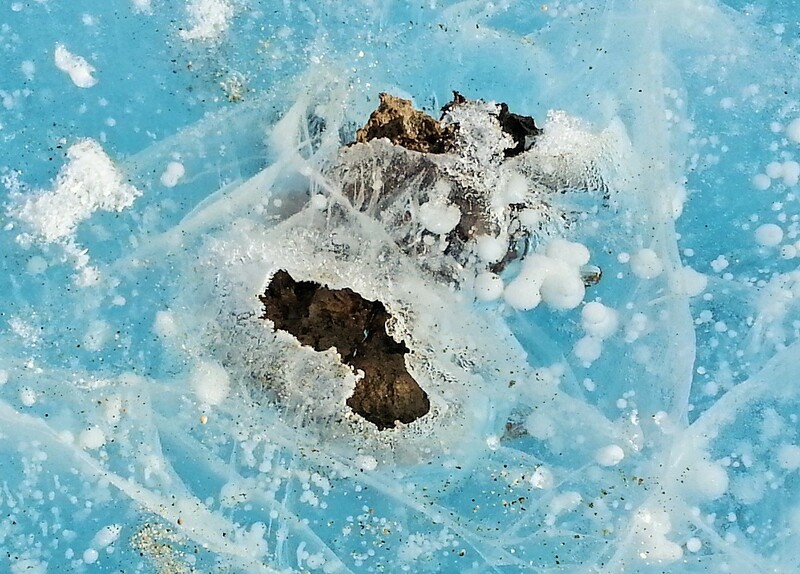 Here is a mat that Chris spotted, buried in ice. Amazingly enough, the cyano mats actually come up from below. First, the cyanobacteria photosynthesize, producing oxygen. 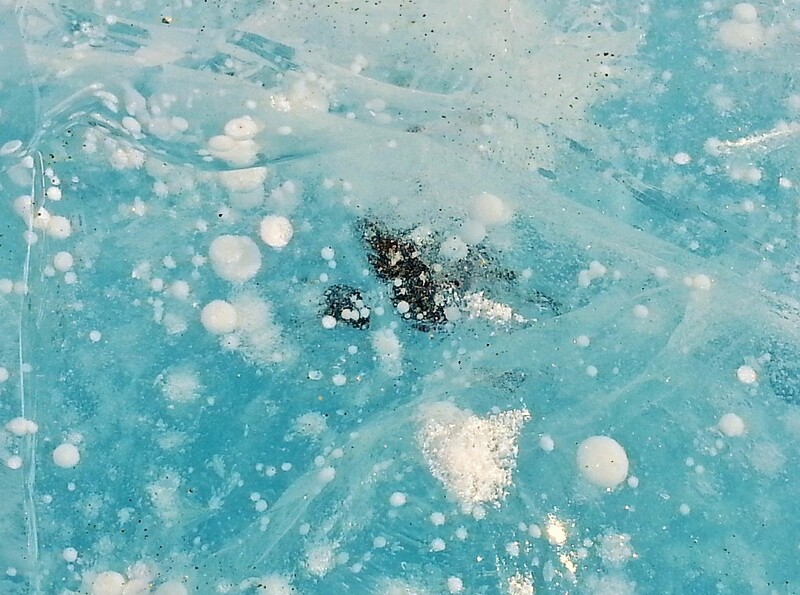 The oxygen bubbles eventually float pieces of mat up to the underside of the ice. 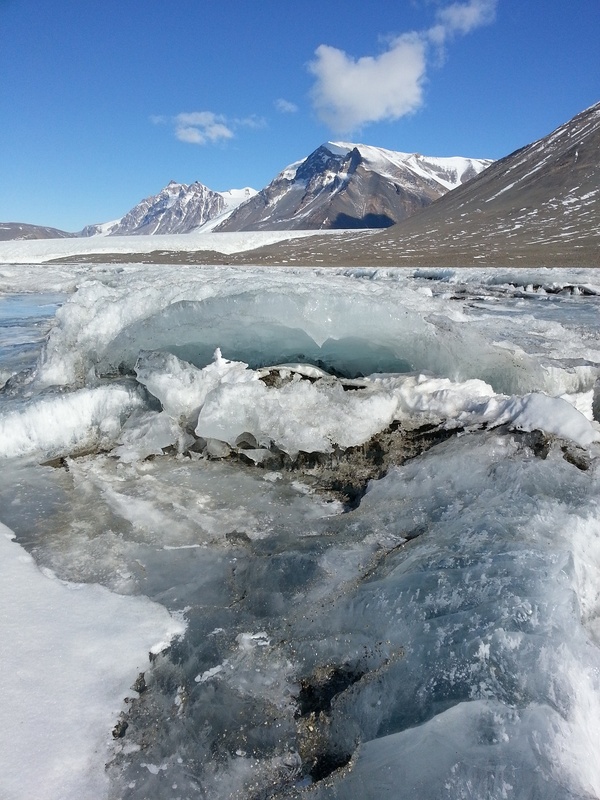 Each year, more water freezes onto the ice, building up beneath the trapped mat. But at the same time, the wind is ablating the ice above. So eventually the mat will poke through the ice elevator. The mats dry out, then blow in the wind, to land in a moat—or perhaps even another lake. Little is known of the genetics or culturing of these uplift mats. So I collected samples of uplift mats to send back home for Kenyon students to culture and sequence DNA. 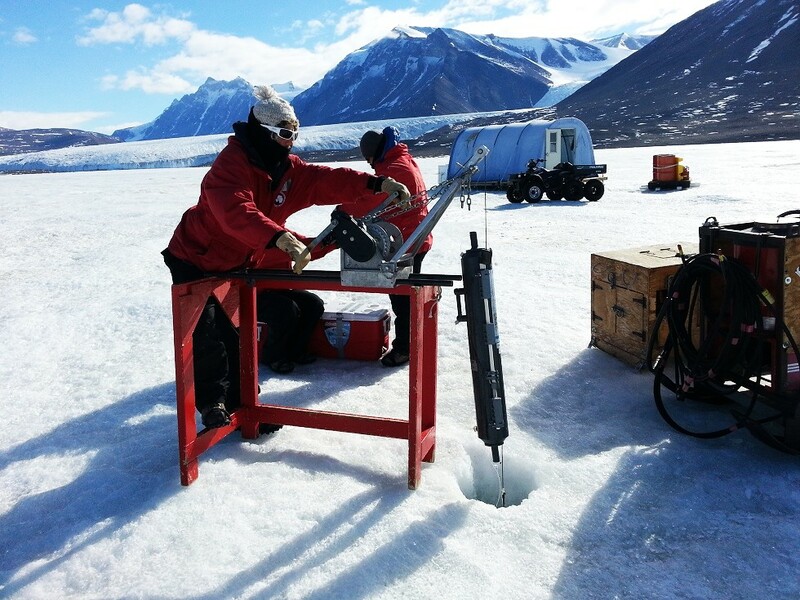 Field sampling at temperatures below freezing is very different from pipetting in the lab. Most of the mats I picked up blew away as I tried to poke them into the 50-ml tube. My bag also blew away, until it was caught, thereby preventing an environmental contamination event. Another time I caused a more serious environmental event by losing a steel ice chipper down an ice hole. The metal content could alter the lake chemistry. Such events are not uncommon, with so many people investigating so many things in the lake. However, it still feels bad. It’s probably a good thing for a full professor to be reminded of what it feels like as a new student in orgo lab (i. e. like a total idiot). Remarkably, my fingers all survived—and so did my Samsung Galaxy 3 that took all these photos and never cracked despite falling on the ice many times. Next post: A leopard seal didn’t make it. 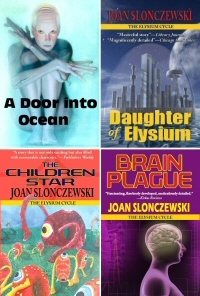 weird and fascinating, Joan, as always.